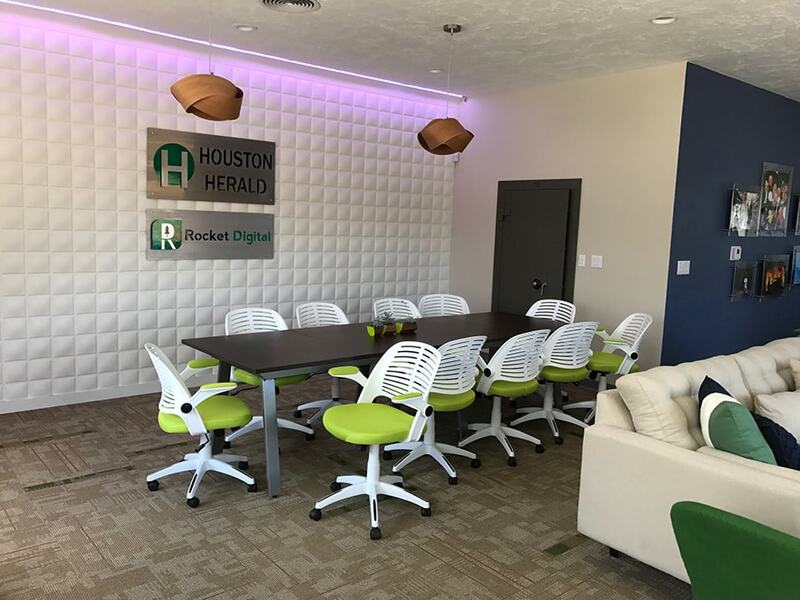 This space was recently purchased by the newspaper to expand their office and create a space to hold community events, host meetings, space to do interviews for broadcast on their website, and they work a lot with the school district and wanted some space that we could tackle projects with students. We did a full renovation, every surface was touched, ceiling, walls, and floors. We took down several wall to create a communal work space, lounge and a casual meeting area, conference area and , interview space. We updated the space with a more modern feel and brought in some mid century touches to pay homage to the newspapers early roots. A gallery wall showcasing the newspaper's award wining photos is an accent wall that anchors the otherwise light and airy space. More light! A new lighting plan added 13 recessed light and 5 pendants to the space! In the conference area a large window shade is also a screen for predestination's to be projected on. We also used Bluetooth speaker light bulbs over the conference table to make presentations easier! 3D focal wall with color changing LED lighting with custom signage. Comfortable mid-century furnishings with custom color block throw pillows.